Change occurs by the actions we take and the choices we make and nowhere is this more apparent than in what we do with our homes. It’s taken a while, but we’ve finally woken up to the fact that sustainability is the future of building and product design. Incorporating it into the most frequently remodeled room in the house – the kitchen – is not only desirable but essential to keeping us healthy, happy and on-trend. By keeping sustainability at the heart of your kitchen design you’ll have a kitchen that lasts; that adds value to your home; that’s healthier; and that makes you feel good every time you enter it.. But how do you design a sustainable kitchen? It wasn’t easy finding a kitchen design company who I felt really understood my brief. But, after my first meeting with Matt Higgins from Sustainable Kitchens I knew immediately that he shared my passion for sustainability and that he’d do everything he could to deliver my vision. You can read more about the project in Sustainable Kitchens’ journal. If you’re planning a kitchen renovation and you want to make it sustainable then the first step is to make a list of priorities, the things that matter to you. It might be recycling, energy saving, low impact materials, water saving, reclamation, recycled materials. The next step is to find a kitchen company who can meet those priorities – go to my source book to see a few companies who might be able to help. Below are some of the key elements I think are important in designing an environmentally-friendly kitchen. Sustainability is synonymous with longevity and one of the best ways of reducing the environmental impact of your kitchen is to make sure that its embodied energy remains locked up for a long time. This means designing a durable, long-life kitchen that can be adapted to changing styles. Don’t be tempted to squeeze your quote down by asking for cheaper hinges, handles and working parts – it’ll be false economy because you’ll buy twice. The same goes for taps – buy the very best you can afford. One of the huge benefits of hand-painted wooden kitchens is that they’re easy to touch-up after a few knocks and they can be re-styled at anytime with a different colour of paint. Volatile Organic Compounds (VOCs) are ubiquitous in home renovation and formaldehyde is particularly hard to avoid because it is present in most manufactured wood products. Reducing formaldehyde levels is especially important in kitchen renovations because higher humidity and temperature levels in the kitchen can lead to greater off-gasing. Even at fairly low concentration levels, formaldehyde can cause nausea and irritation to the nose, throat and eyes. At higher levels, and with prolonged exposure, it can cause cancer. Most kitchen companies (even bespoke ones) will make their carcasses and centre door panels from either plywood, mdf or chipboard. But by specifying that the plywood or MDF is graded E1 you’ll be guaranteeing formaldehyde emissions of less than 0.1 part per million. Sustainable Kitchens use only high grade E1 birch plywood for their carcasses which not only assures low emissions but also gives greater protection from swelling and cracking. There’s a good article here giving general tips on reducing formaldehyde in our homes. Using reclaimed materials is the easiest way to increase sustainability – it stops things going to waste and preserves virgin resources. It’s been growing as a style for a while and now it is fully embedded in mainstream interior design. There are lots of opportunities for incorporating reclamation pieces into kitchens. Reclaimed encaustic tiles from Spain make an excellent kitchen splashback. Antique tile restorer and founder of Maitland & Poate, Chris Brooke, explains that old encaustic tiles are more forgiving with stains and scratches than their new alternatives. Store room fitted out with scaffold plank shelving and antique tile worktop. If you don’t have the time for reclamation or the budget for a solid wood kitchen then Ikea have developed their Kungsbacka kitchen which is made from recycled industrial wood wrapped in foil made from recycled PET bottles. Product designers are realising that responsible sourcing and manufacturing are central to the buying decisions of younger generations and that they have to develop products that resonate with their environmental conscience. Most bespoke kitchen companies will use oak or poplar imported from the USA or Europe because they can guarantee the supply chain. But there are increasing numbers of UK timber merchants who supply British grown woods for construction and carpentry. Vastern Timber supply English pippy and burr oak which is distinctive for its knot clusters which pepper the grain. 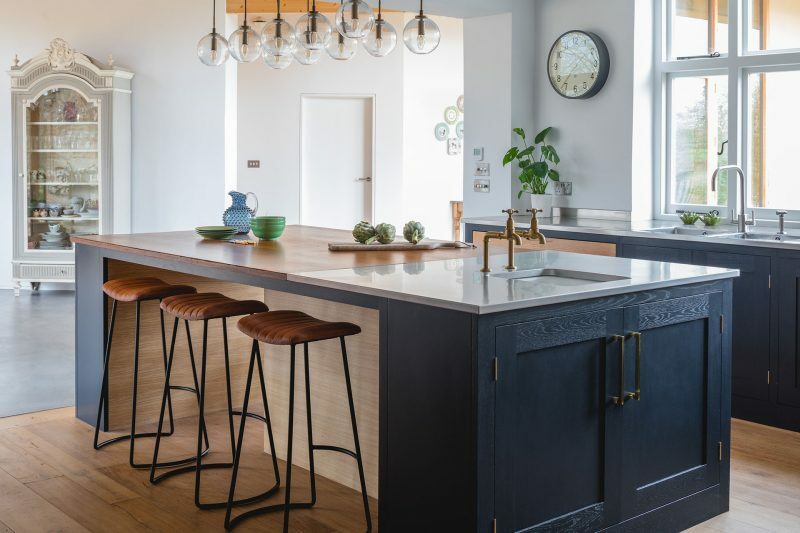 It may not be feasible to have your entire kitchen made from British timber (although see below the Sebastian Cox kitchen by deVOL) but by incorporating an element of it into your design you’ll be supporting small British timber merchants and encouraging the planting of new mixed woodland in the UK which is essential for biodiversity and climate change mitigation. For our kitchen I went to Somerset to pick out a selection of British woods from Interesting Timbers for a set of drawers. Read this post from Sustainable Kitchen’s supplier spotlight to find out more about Interesting Timbers. The Sebastian Cox kitchen by deVOL is made entirely from British grown timber. It uses birch plywood for the carcass, overlooked British woods such as beech and ash for the doors and subtle wood stains rather than paint.